Bayswater City have bounced back from two defeats in the PS4 National Premier Leagues WA with a hard fought 2-1 win against Armadale at Finance 365 Stadium on Saturday afternoon. Todd Howarth gave the home team the lead early, before Hayden Doyle scored a stunner on the stroke of half time. Armadale substitute Dylan White pulled one back late, but they couldn’t find the equaliser. Doyle said it was a huge result to get their season back on track. 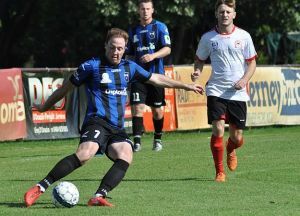 “We’ve been letting ourselves down in the second half this season, and they (Armadale) came back into the game today, but we managed to hold out and it was a good three points,” he said. “We’ve tried to stay positive over the past fortnight after the two defeats, and we’ve stuck to our game plan. His strike will be a contender for Goal of the Season, but he said the three points were more important. “I was really pleased to get on the scoreboard, I’ve been working really hard in the past few weeks and it’s nice for something to go my way, but the win is more important,” he said. Bayswater’s Assistant Coach Alun Vernals said it’s good to get back in the winner’s circle. “We dominated the first half and really moved the ball around the pitch well, and were rewarded with a great free kick from Todd and a real cracker from Hayden” he said. It was an early start for the game, a 1pm kick off, but it didn’t effect Bayswater who dominated early, and Armadale keeper Alfie Brincat had to be alert on eight minutes to push Jamie Coyne’s long-range shot around a post. Then four minutes later the home side hit the front. Howarth’s curling free kick from 18m beat Brincat at his near post. It was nearly two on the half hour, Howarth’s superb through ball sent Jason Mirco clear, but Brincat stood tall to save. Armadale hit back before the break, Caleb Dixon’s long-range shot flashed wide, before Alex Castiello headed inches over. They went even close on 40 minutes, Jordan Candlish burst into the penalty area, but his shot was pushed onto the post by Fraser Greenwood. But in the shadows of half time the home side doubled their advantage. Doyle played a one-two with Mirco down the right, and the former Stoke City trainee cut inside his marker and hit an unstoppable shot into the top corner of the net from the edge of the penalty area. The visitors opened the second half well and Jake Sardelic saw his shot crash off the crossbar three minutes in, before Greenwood saved well to deny Alex Healing. Both sides pressed as the game opened up, but it was Armadale who were back in the contest on 81 minutes. A poor back pass by Nathan Costello put Greenwood under pressure and as the keeper attempted to clear the ball it ricocheted off White, who ran into an empty net to score. The visitors were now on top and they almost got the equaliser late. Good work from substitute Papa Kpatar on the right, ended with Alex Salmon’s shot, which hit a Bayswater defender. The Armadale players were convinced it had struck an arm, but referee Alex Novatsis was well placed to turn down their appeals.